This specialty honey comes exclusively from the Kodai forests. Asian Honey Bees (Apis Cerana) build small hives in crevices of trees and mounds, which are rich in golden sweet honey and have fine floral undertones. 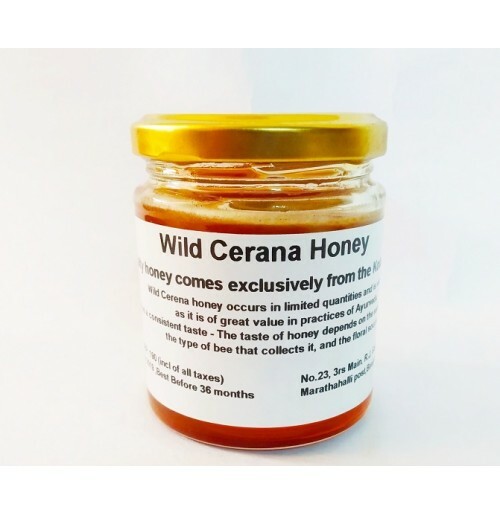 Wild Cerena honey occurs in limited quantities and is very rare, as it is of great value in practices of Ayurveda. This honey is gotten by a group of four women who work together to bring wild honey gathered by adivasi communities of the Palani Hills in Tamil Nadu to you. The Paliyans, an indigenous tribe in the Palani hills, foray into the Shola forests in groups for days to gather the honey. They camp in the forests and build their tools on the spot with vines and dried twigs. A small prayer is offered before skilful climbers clamber up (trees or cliffs) to the hives. They smoke out the bees, deftly collecting only the honey chamber of the hive. The honeycombs are brought down and the honey is extracted. Leaving behind hives for the following season and the bees, they return with cans of honey on their long journey home. Honey is naturally golden in colour - The colour of honey varies widely and depends on the flowers the bees feed on. Honey can be blonde, burgundy, dark brown and even golden. Crystallised honey has been tampered with (by adding sugar or jaggery) - Honey crystallises in cold weather due to its glucose content. Simply placing the jar in warm water brings it back to its liquid state. In fact, in certain parts of the world, crystallised honey is used like a jam. Honey has a consistent taste - The taste of honey depends on the season of its collection, the type of bee that collects it, and the floral source. In fact, not only do varieties of honey taste different, different batches of the same variety also do. A layer of residue on top of the honey shows honey has gone bad - The residue formation on top of the honey is nothing but pollen, naturally found in the honey. When honey is left untouched for a long period of time, the pollen forms a thin film on top. Simply stirring the honey will make the pollen dissolve.In fact, more and more people today consider bee pollen to be a superfood. In many countries, bee pollen is consumed as a distinct item.